We fished one of our private waters that makes up the Clinch River. We saw some rises to start, we fished a large dry….a size 12 Fat Albert. It was insane, 12 to 15 rainbows in the first hour. There were few bugs hatching but a lot of flying ants coming down. 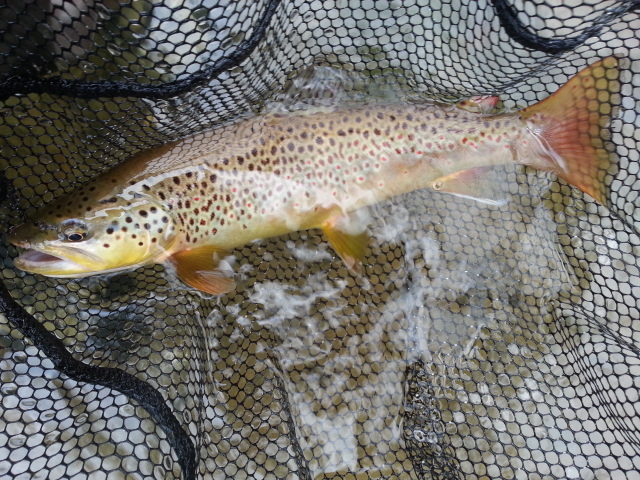 We worked our way upstream just absolutely killing them….landed several fish in the 22" to 26" range. We used a variety of stuff, large nymphs , Y2Ks , egg patterns….you name it. 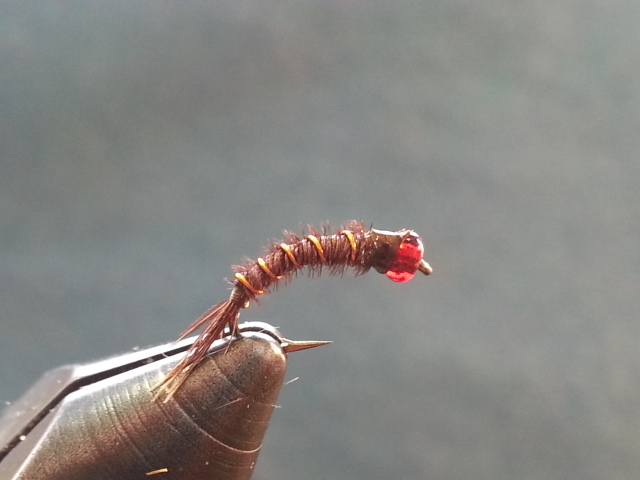 Absolutely murdered them on a new streamer I have been using and working on….I call it a VooDoo leech. It killed them. Caught a bunch of giant rainbows on it and three big smallmouth on it as well. 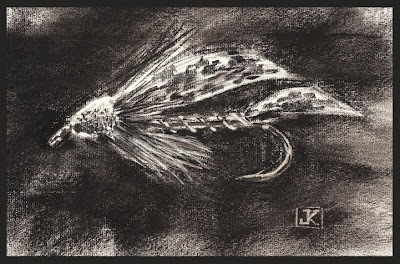 It kills ’em…… I cant wait to sling some 6 and 8 inch versions of this fly. 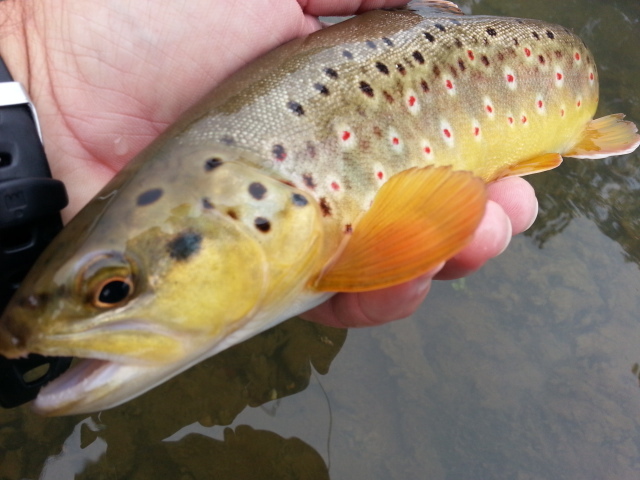 Some trophy browns are going down…. 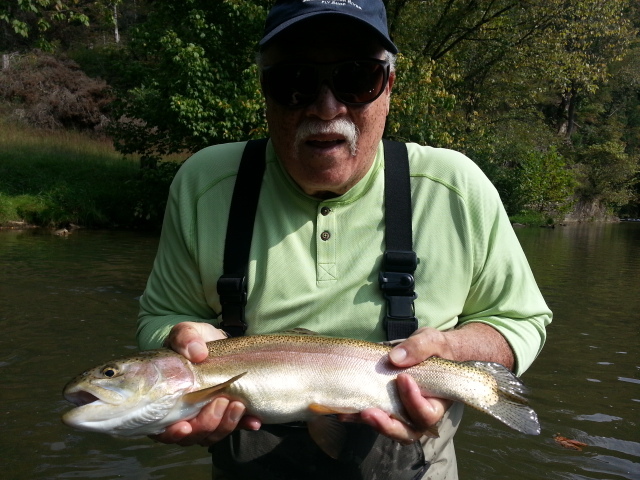 Finished with over 40 rainbows, 5 of them 22 to 26 inches and 3 big smallmouth….all good ones. What a great day…..pretty incredible. Ed did a great job, we both left tired and satisfied. Have a couple days off then & a very busy week and month coming up. Lots of trips, getting our newsletter out, and also working on getting a drift boat from Bozeman, MT to here. Plenty to do! One quick announcement, I have gotten an offer to be the Nat Greene Flyfishers 2014 Spring Conservation Banquet speaker….an honor and will be great fun. 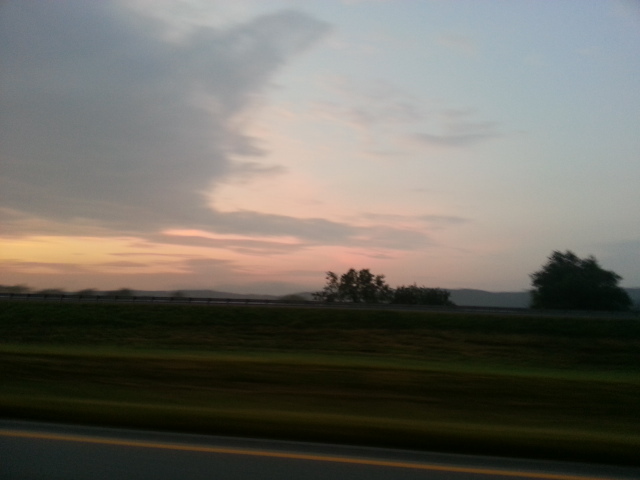 Fri. Sept. 20, 2013……What a nice, cool morning in SW Virginia. Looks like a nice cool day ahead and I am headed to meet my client for today Ed McGee from Raleigh, NC. 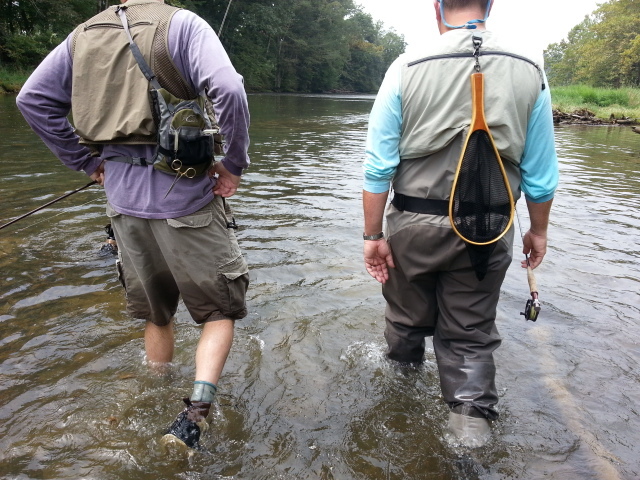 I am guiding Ed on one of our private waters….a trib to the Clinch River. 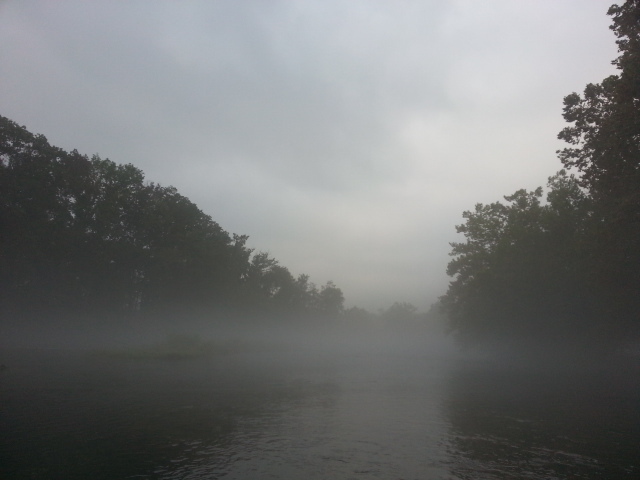 Should be a great day and some large rainbows and aome smallmouth too. 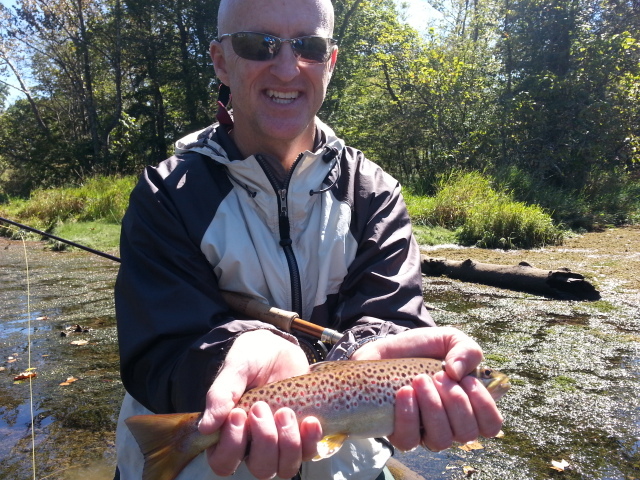 Great Fishing, Fantastic Fall Like Weather…..
Mon. Sept. 16, 2013…. This post from the weekend, Saturday’s trip……guided Trip, Rob Fountain, Chris Ramseur, High Point, NC, TN Tailwaters, a cool night in the upper 40s F and high around 70F…Fall is definitely on its way in….. a great day……..and it was indeed good. Met Chris and Rob early and we were in the water early and were in fish almost from the start. There were a few rising fish, but not many, and few bugs. We used some of my micro nymph rigs and did very well, landing about 35 fish or more as we fished til the water came up on us at 245pm. We had on three 20 inch fish, played them well, but that ended up breaking off ….what a bummer. Two of them were in the 23 to 25 inch range, both rainbows. It was a beautiful day, very fall like, lows in the low 40s and high around 74F. Bluebird skies……few clouds…..the fish were eating but it was all subsurface. 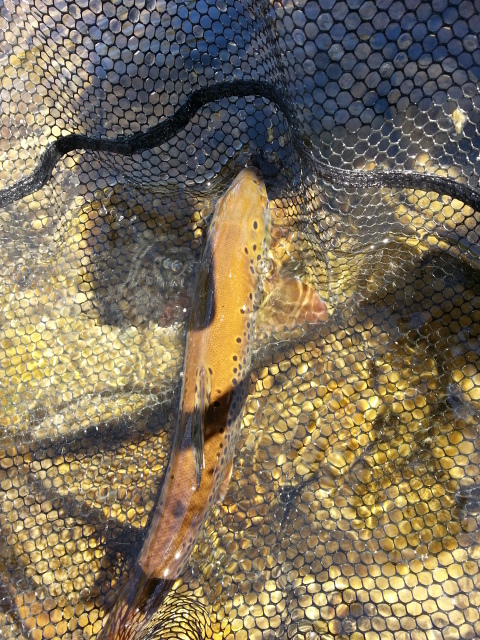 Shaping up to be a great fall on the SoHo, and we’ll be here alot in the coming months, both wade and float fishing. 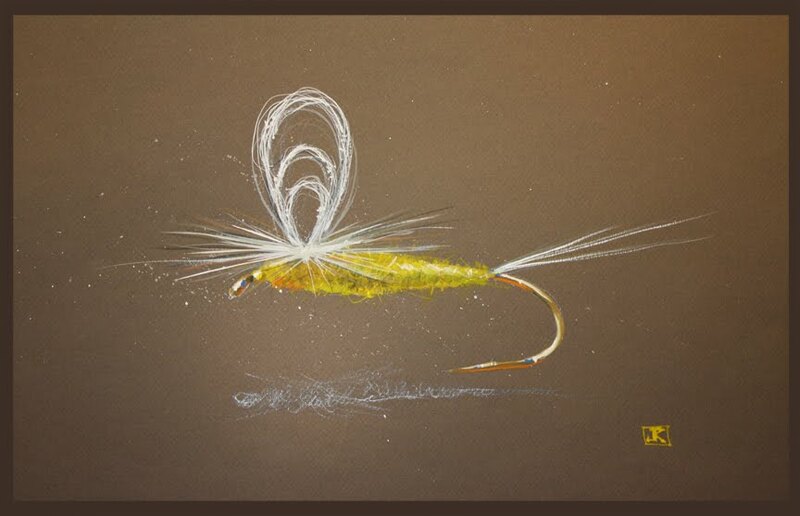 Fall is small fly time on the SoHo and usually another strong flurry of sulphurs just before things turn off cold….some great fall fishing lies ahead. Looks like its shaping up to be a really busy fall…..trip bookings are up about 10% over last year this time so it looks to be pretty busy. I am looking forward to our Fall and Winter seasons, that is big fish time. Our Oct is almost full and so is November, and December will be next. Great But Stormy Saturday in East TN…. Mon. Sept. 2, 2013….Happy Labor Day…hope you are enjoying some time off with your family or on the river…its all good. Just a quick update from Saturday, did a guided Trip with Tim, Taylor,and Scott Henegar, Greensboro, NC, South Holston TN, Had some early thunderstorms that threatened to damper the day with muddy water, but the morning pulse pushed enough of it out that the water cleared enough to fish. It was clear early, and only after only a scant number of rises did I buy into the reality that to be successful with the conditions we’d be nymphing today, Not the first sulphur….and only a couple blue winged olives…..I knew nymphing with either droppers or out right nymphing with indicators would be the way to catch some fish. Or rip streamers….just not my idea of fun if fishing low water on the SoHo. In a boat, hey that’s fine, but wade fishing. Nope. Its usually dries or bust. But today was nymphing both with droppers and with an indicator. Fortunately, both ways worked and we caught about 50 to 60 fish overall, up to 18-19″, and all but 5 of them were on subsurface patterns. I did what I have done for years, fish the slots and holes when its dirty and go from there. It was the right call, excellent fishing with subsurface stuff while few anglers around us were catching anything. 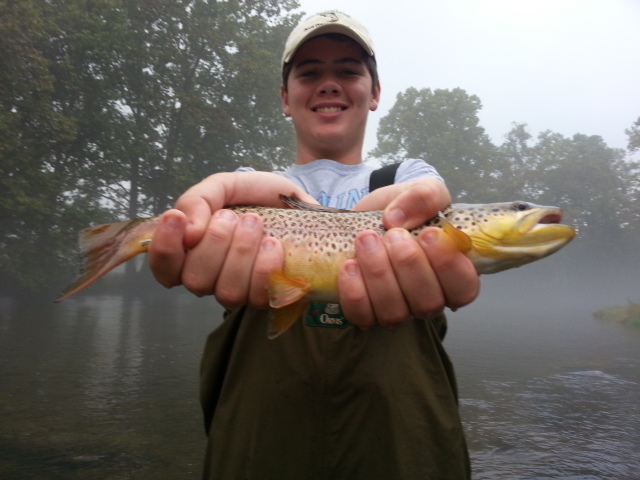 Taylor, Scott’s 14yr old son, did very well for only his second time flyfishing. He landed 20 fish, and the largest of the day, a fish that was darn close to 20 inches. Scott and Tim split the rest, and most fish coming on dry/dropper rig and almost all on the dropper. Flashy small nymph patterns, whether micro patterns (midges) or flashy mayfly patterns, didn’t seem to matter. The fish have to see it. In any case, did the trip, fishing was great. Brief stop, then on to an evening Casting lesson further up river with Dr Scott and Diane Bertrand, and we got in the water and got a few minutes into it when a massive thunderstorm hit. I stayed around for a while but it never quit. So home I headed…….a 17hr day…whew and time for some rest. 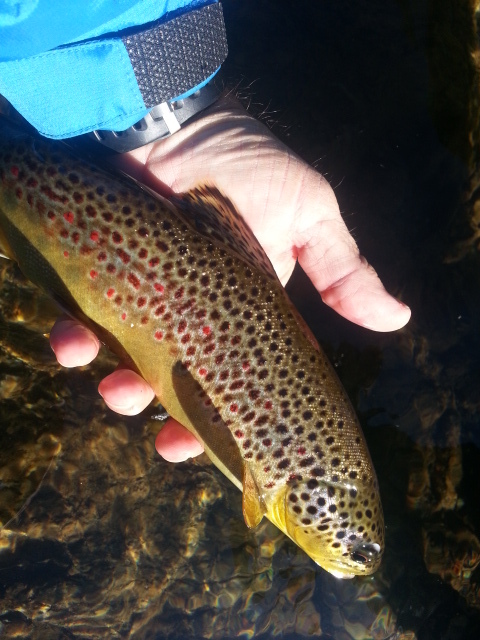 September is finally upon us and that’s transition time, and we’ll be seeing caddis, Fall olives, the last round of Sulphurs on the South Holston upper section, the start of our streamer season, and the resuming of DH stockings on local NC streams. All in all, October kicks this off. Until then, small flies and terrestrials and attractor flies if you are on small water will rule. Simple as that. Click here for a FREE printable PDF September Hatch chart . One thing is for sure, we’ll have good conditions and water levels when fall gets here. Probably the best in well over a decade.